Department of Posts Has Released Recruitment Notification For 748 Gramin Dak Sevak Posts. All Eligible & Interested Candidates Can Apply Online.Further Detailed Information Regarding Educational Qualifications, Age Limit, Selection Procedure, Exam Pattern, Syllabus for Department of Posts Recruitment 2017 - 748 Gramin Dak Sevak Post is mentioned below. Candidates age should be between 18 to 40 Years As on (24-05-2017). All Eligible Candidates will Be Selected Based on Their Performance In Merit List . Rs. 2295 - 3695/- (GDS Packer & GDS MC), Rs. 2665 - 4165/- (GDS MD), Rs. 2745 - 4245/- (GDS BPM) . All Eligible & Interested candidate fill the online application through official website (http://www.indiapost.gov.in). before / (5th June 2017). Online Registration Would Be Open From - 25-04-2017. Closing Date For Apply Online : 05-06-2017. 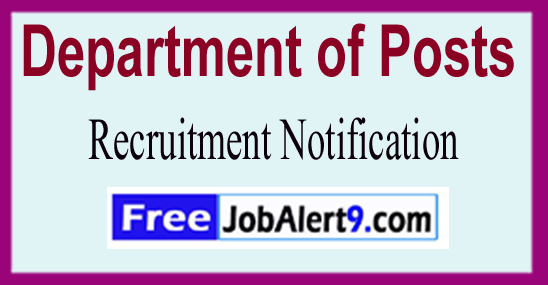 Click Here For Department of Posts Recruitment 2017 Advertisement. Department of Posts Has Released Recruitment Notification For 4982 Gramin Dak Sevak Posts. All Eligible And Interested Candidates Can Apply Online.Further Detailed Information Regarding Educational Qualifications, Age Limit, Selection Procedure, Exam Pattern, Syllabus for Department of Posts Recruitment 2017 - 4982 Gramin Dak Sevak Post is mentioned below. Candidates age should be between 18 to 40 -Years As on (24-05-2017). Educational Qualification - Candidates should have done 10th or its equivalent qualification from a recognized university. All Eligible & Interested candidates may fill the online application through official website (http://www.indiapost.gov.in). before or on (10th June 2017). Online Registration of Application Form Is Starts From - 25-04-2017. Dead Line To Submit Online Application Is - 10-06-2017. Department of Posts Has Released Recruitment Notification For 579 Gramin Dak Sevak Posts. All Eligible & Interested Candidates Can Apply Online.Further Detailed Information Regarding Educational Qualifications, Age Limit, Selection Procedure, Exam Pattern, Syllabus for Department of Posts Recruitment 2017 - 579 Gramin Dak Sevak Post is mentioned below. Candidates age should be between 18 to 40 -Years As on (18-05-2017). Rs. 2745 - 4245/- (GDS BPM), Rs. 2665 - 4165/- (GDS MD), Rs. 2295 - 3695/- (GDS MC & GDS Packer) . All Eligible & Interested candidates may fill the online application through official website http://www.indiapost.gov.in before / (2nd June 2017). Online Registration Starts From - 19-04-2017. Last Date To Submit Online Application - 02-06-2017. Click Here For Department of Posts Recruitment 2017 Detailed Advertisement. Department of Posts Has Released Recruitment Notification For 128 Gramin Dak Sevak Posts. All Eligible And Interested Candidates Can Apply Online .Further Detailed Information Regarding Educational Qualifications, Age Limit, Selection Procedure, Exam Pattern, Syllabus for Department of Posts Recruitment 2017 - 128 Gramin Dak Sevak Post is mentioned below. Candidates age should be between 18 to 40 -Years As on (08-05-2017). Rs. 2745 - 4245/- (GDS BPM), Rs. 2665 - 4165/- (GDS MD), Rs. 2295 - 3695/- (GDS Packer), Rs. 3635 - 5585/- (GDS MC) . All Eligible & Interested candidate fill the online application through official website (http://www.indiapost.gov.in) before / (5th June 2017). Online Registration of Application Form Is Starts From - 10-04-2017. Last Date For Apply Online - 05-06-2017. Department of Posts Has Released Recruitment Notification For 1048 Gramin Dak Sevak Posts. All Eligible And Interested Candidates Can Apply Online .Further Detailed Information Regarding Educational Qualifications, Age Limit, Selection Procedure, Exam Pattern, Syllabus for Department of Posts Recruitment 2017 - 1048 Gramin Dak Sevak Post is mentioned below. Candidates age should be between 18 to 40 -Years As on 08-05-2017. Rs. 4220 - 6470/- (GDS MD), Rs. 3635 - 5585/- (GDS Packer), Rs. 2295 - 3695/- (GDS MC), Rs. 4115 - 6365/- (GDS BPM) . All Eligible & Interested candidates may fill the online application through official website (http://www.indiapost.gov.in) before or on (31st May 2017). Starting Date of Online Submission of Application Form Is - 08-04-2017. Last Date of On-line registration - 31-05-2017. 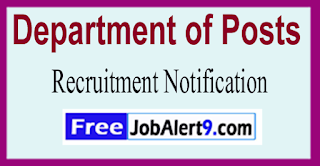 Department of Posts Has Released Recruitment Notification For 16 Gramin Dak Sevak Posts. All Eligible And Interested Candidates Can Apply Online .Further Detailed Information Regarding Educational Qualifications, Age Limit, Selection Procedure, Exam Pattern, Syllabus for Department of Posts Recruitment 2017 - 16 Gramin Dak Sevak Post is mentioned below. Rs. 4220 - 6470/- (GDS MD), Rs. 3635 - 5585/- (GDS Packer), Rs. 2295 - 3695/- (GDS MC) . All Eligible & Interested candidate fill the online application through official website (http://www.indiapost.gov.in) before / (31st May 2017). Online Registration Would Be Open From - 08-04-2017. Last Date of Online Application Is - 31-05-2017.